James Hamilton, associate professor of biblical theology at Southern Baptist Theological Seminary in Louisville, Kentucky, has written a helpful book explaining the place of the Old Testament book of Daniel in biblical theology. I read the book in preparation for my sermon series on the book of Daniel at Farmdale Baptist Church. It served as a great introduction to the book and the larger themes of redemptive history that are prominent in the book. Hamilton uses the chiastic structure of Daniel to summarize the message of Daniel into one sentence. I find this to be a helpful and concise, yet comprehensive explanation of the message of Daniel. It reflects the overall structure of the book and accounts for the content of each chapter (see below). Daniel encourages the faithful by showing them that though Israel was exiled from the land of promise, they will be restored to the realm of life at the resurrection of the dead, when the four kingdoms are followed by the kingdom of God, so the people of God can trust him and persevere through persecution until God humbles proud human kings, gives everlasting dominion to the son of man, and the saints reign with him. 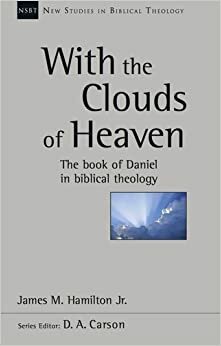 James M. Hamilton, Jr. With the Clouds of Heaven: The Book of Daniel in Biblical Theology. New Studies in Biblical Theology 32. Downers Grove, IL: InterVarsity Press, 2014, 83. The book is not available in the US until next month (September 2014), but you can pre-order the volume here. If you can’t wait until then, consider ordering the book from the UK where it has already been released. A 2007 study by the academic journal Science indicated that humans speak an average of 16,000 words per day. The study found that the difference in the number of words spoken by men and women is negligible with women speaking 16,215 words and men speaking 15,669 a day. This study contradicted a study the previous year by Louann Brizendine, founder and director of the University of California, San Francisco’s Women’s Mood and Hormone Clinic, in her 2006 book The Female Brain. This book claimed that women speak an average of 20,000 words per day, nearly three times the mere 7,000 spoken by men. I don’t want to get into this debate today. I will let you husbands and wives settle this dispute on your own time. Let’s assume for a moment that we only speak 10,000 words a day. If that’s the case every five days enough words come from your lips to produce a 200 page book. Every five days! That’s 73 books a year. You can do the math on how many books your words would fill in your lifetime. Of all those words you’ve spoken in your lifetime, how many would you consider to be said carelessly? A lot of them! This is sobering when we consider the words of Christ in our text this morning that “on the day of judgment people will give account for every careless word they speak.” What does Jesus mean by this? There are two important principles that we need to consider. Let’s look at this morning’s text and see just what it means. I. Our Words Reveal the State of Our Hearts, vv. 33-35. Remember in the context that Jesus has just addressed the Pharisees who have committed the unpardonable sin by rejecting the evidence provided by the Holy Spirit through the miracles of Jesus that He was indeed the Messiah. Jesus was able to pronounce his judgment upon the words of the Pharisees precisely because He knew their thoughts (v. 25). In other words, Jesus know that the Pharisees’ words of blasphemy reflected hearts of blasphemy and He was therefore able to pronounce their final judgment in advance. The principle is stated clearly in the second half of verse 34: “out of the abundance of the heart the mouth speaks.” In other words, as I’ve stated it: “Our Words Reveal the State of Our Heart.” This is a scary proposition! Having six children 13 and under means that for the last 13 years we’ve had a cup of something spilled every single meal. Often, someone will call out, “It’s just water.” This means they will be no sticky, sugary mess to clean up. We just have to get a towel and soak it up. Do you know what? We’ve never had anything come out of those cups that wasn’t in them. Whatever is in the cup, whether water, juice, milk, or Diet Dr. Pepper, that’s always what comes out. In a similar way, Jesus says that whatever is in our heart is what will come out of our lips with our words. When something jars you or upsets you and words come out of your mouth, it’s because they’re in your heart and they’re in your heart because you put them there! We often say in words meant to comfort that “God knows our heart.” We are often reassured by thinking that although our actions and words may have been wrong, that God knows our heart and our heart is good after all. But this is not what the Bible tells us about our hearts. In Jeremiah 17:9, the prophet Jeremiah declared: “The heart is deceitful above all things, and desperately wicked; who can know it?” Jehovah God responded, “I the LORD search the heart and test the mind, to give every man according to his ways, according to the fruit of his deeds.” Biblically, it is usually not a good thing that God knows our heart! It certainly wasn’t good for the Pharisees in Matthew 12. The teaching of Scripture is clear: the words that come out of our mouths reveals what is in our heart. Therefore, the next principle is true. II. Our Words Will be the Basis of Our Judgment, vv. 36-37. Here’s where it gets serious! Jesus says that we will give an account on the day of judgment for every careless word which we speak! How many careless words have you spoken? If you’re 10 years old, consider nearly 700 books filled with your words. If you’re 40 years old, then you can imagine a library of nearly 3,000 two-hundred page books containing the words spoken in your lifetime. If you’re 60, imagine almost 4,500 such books. We have a lot to give an account for. Jesus says in verse 37 that our words will either justify or condemn us. We need to realize that no matter how careful we have been with our words in our lifetime, there is more than enough evidence to condemn us to hell forever. If this is the final word, then we are all hopeless condemned sinners. But I like the glimmer of hope of justification that is hinted out in verse 37. Some commentators take a lot of pains to explain why the gospel word “justified” is used here. They say that it is being used in its technical sense to refer to an acquittal in a court of law. That is certainly true, but I think there is at least a foreshadowing of the justification that comes through the “word of faith” which Paul talks about in Romans 10:5-10. For Moses writes about the righteousness that is based on the law, that the person who does the commandments shall live by them. But the righteousness based on faith says, “Do not say in your heart, ‘Who will ascend into heaven?’” (that is, to bring Christ down) or ‘Who will descend into the abyss?’” (that is, to bring Christ up from the dead). But what does it say? “The word is near you, in your mouth and in your heart” (that is, the word of faith that we proclaim); because, if you confess with your mouth that Jesus is Lord and believe in your heart that God raised him from the dead, you will be saved. For with the heart one believes and is justified, and with the mouth one confesses and is saved. These verses state the same truth in a positive sense that Matthew 12:33-37 states negatively. Namely, your words reveal the state of your heart and your words will be the basis of your judgment. But here we are told that belief in the heart that is confessed with the mouth results in being justified/saved! Isaiah tells us that “they made his grave with the wicked and with a rich man in his death, although he had done no violence, and there was no deceit in his mouth” (53:9). Yes, He was crucified, dead and buried though He was the spotless Lamb of God. Therefore, His death was not for His sins, but for the sins of all those who would put their trust in Him. Won’t you trust Him? One of my friends posted a great reminder on Twitter this morning. He said, “The Triumphal Entry occurred on lamb selection day for Jews. Jesus’ gesture: “Pick me as your Passover Lamb without blemish.” [@greg_thornbury Sun 24 Mar 08:26] This is Palm Sunday, the day of the Triumphal Entry, lamb selection day. Why look elsewhere for salvation? Here is Jesus, the Lamb of God who will take away your sin if you trust in Him. There has been a lot of speculation about the nature of the unpardonable sin. Some have suggested that divorce, murder or suicide. But none of those sins are identified as unforgivable in the Bible. Others fear that they have committed the unpardonable sin because of an unguarded thought or word against the God the Father, Son or Holy Spirit. Some think that an irreverent joke might be the unpardonable sin. But the idea of the unpardonable sin comes directly from the lips of Jesus. In our text this morning, Jesus says that every kind of sin and blasphemy can be forgiven, except for one. What does He say that it is? That’s what we want to consider in this passage. I. The Occasion of the Miracle, vv. 22-23. II. The Accusation by the Pharisees, v. 24. It is unclear whether the crowd asks this question out of faith or doubt? There seems to be a hint of skepticism in the Greek at this point, like “He can’t be the Son of David, can he?” But the Pharisees did not even want the issue raised. They immediately reject this possibility by asserting that the miraculous deeds done by Jesus can only be attributed to Satan himself. Notice what they are doing. They are taking the miracles which Jesus has performed by the power of the Spirit which identify Him as the messianic king, the Son of David and are rejecting that evidence and saying that these miracles were performed by the power of Satan. III. The Reaction by Jesus, vv. 25-32. First, he points out the illogical nature of their accusation, vv. 25-26. Second, he points out the inconsistency of their accusation, v. 27. Then, in verses 28-29, Jesus argues that, contrary to the Pharisees, the inclination of the crowd to identify Jesus as the promised Davidic king was dead on. Jesus asserts that since He is performing this miracles, since He is casting out demons, this is evidence that the kingdom of God has come among them because the king was standing in their midst! So, what is the sin that Jesus is discussing here that is unforgivable? It is a blasphemy of the Holy Spirit. John Walvoord has defined this sin as “attributing to Satan what is accomplished by the power of God.” D. A. Carson has defined the blasphemy against the Holy Spirit as “the willful assigning of what is unambiguously the Spirit’s work in the ministry of Jesus (12:28) to the devil (12:24).” In other words, Jesus is referring to the sins of the Pharisees in this text who have rejected the evidence provided by the Holy Spirit through the miracles performed by Jesus that He is indeed the Messianic King. Their rejection is unforgivable at this point, because they have sufficient evidence that Jesus is the Messiah. They know the Old Testament prophecies and they have seen the miracles in person. Yet, they reject Jesus as their Messiah. Jesus essentially says in verse 30 that you’re either with me or against me. They have aligned themselves against Jesus by their rejection and therefore there is no forgiveness available for them. Now, for the question: Can this sin be committed today? If we take this question in a very strict sense, we would say no. This sin could only have been committed by people who were alive during Jesus’ earthly ministry who knew the Scriptures like the Pharisees and saw the miraculous signs performed by Jesus. But, I believe that this sin can still be committed today. Because it is still possible to reject the evidence provided by the Holy Spirit in Scripture and through His internal conviction that Jesus is the Messiah, the Son of David, the Savior, the Son of God. When an individual is brought to a certain point by the Holy Spirit where they are convinced that Jesus is indeed the only Savior, and they still reject Him at that point, then there is no other hope available for them and their sin is unpardonable. I think this is what the author of Hebrews is talking about in Hebrews 6:4-6, 9. These people have been exposed to the working of the Holy Spirit, even having been enlightened, but not yet converted. If people brought to that point do not trust Christ, salvation is impossible for them. Don’t be that person! How can you guarantee that you’ve not committed the unpardonable sin? Don’t reject Christ. Respond positively to each step of revelation given to you by the Spirit. Don’t reject His testimony in the pages of Scripture and His working in your heart! In the August 2011 issue of The Gospel Witness, I had an article published on Romans 8:18-25. The kind folks at The Gospel Witness have graciously granted me permission to post a PDF of my article. The title of my article is “The Redemption of the Body”: A Meditation on Romans 8:18-25.